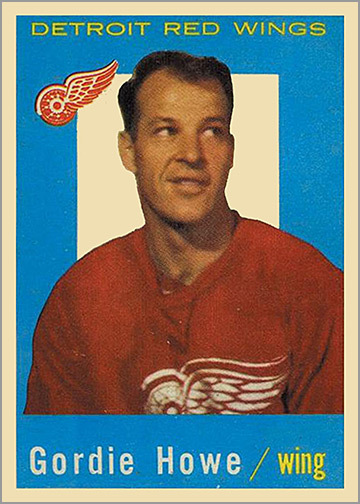 Since no hockey cards were released during the first five years of Howe’s career, he did not have a “rookie card” until the 1951-52 season. The 1951-52 Parkhurst Hockey Set is considered hockey’s first “modern” hockey card set. So many Hall of Fame players have rookie cards in this set, including Maurice Richard, Ted Lindsay and Howe. 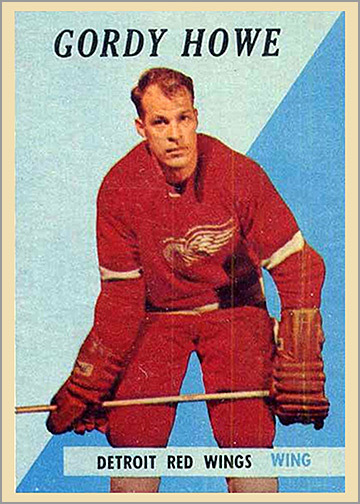 In the 1951-52 season, Howe again won the Art Ross Trophy as the NHL’s leading scorer. He won his first Hart Trophy as NHL MVP. 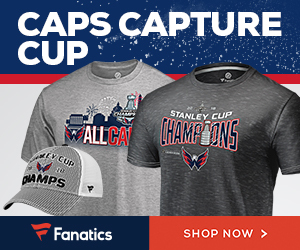 He played in his fifth All-Star Game, was a First Team All-Star and won the Stanley Cup for a second time. The next year, it appears that Parkhurst would use the same reference photo for their painting of Howe. This time, the detail is better. 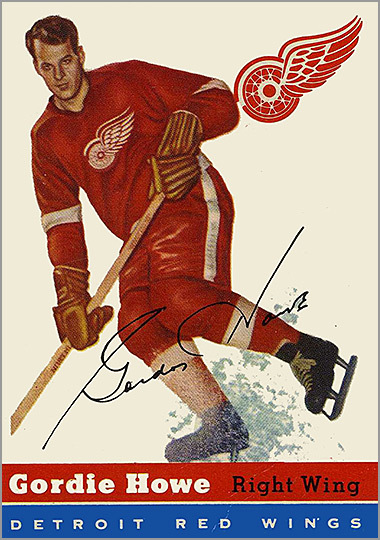 The card also has a facsimile autograph of Howe at the bottom. Like his card, Howe’s on-ice performance was also very close to the previous year. Howe won the Art Ross Trophy, the Hart, was First Team All-Star and played in the All-Star Game yet again. He scored 49 goals this season, which was the most goals he scored in a season. 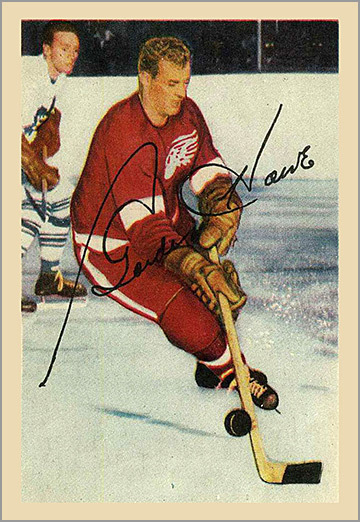 After five years of no hockey cards, followed by two years of static poses, Howe’s third hockey card features an action shot. Here, he is trying to settle a bouncing puck as a Maple Leafs defender looks on. 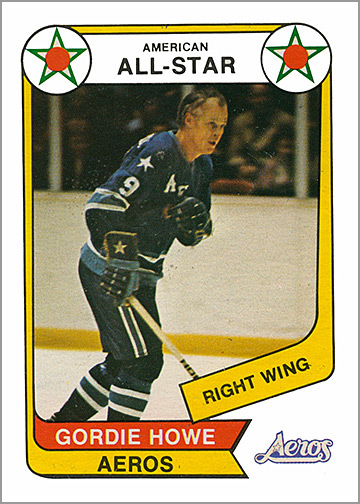 Once again, Howe won the Art Ross Trophy, was a First Team All-Star and played in the NHL All-Star game. For a third time in his career, he won the Stanley Cup. 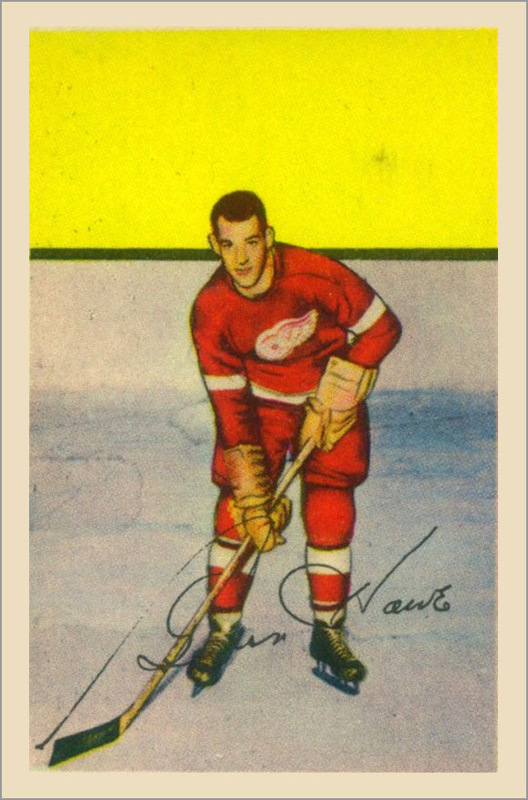 Topps started making hockey cards during the 1954-55 season, giving Parkhurst some competition. 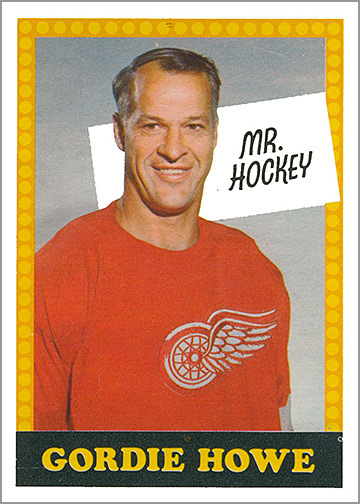 Both sets released cards of Mr. Hockey. 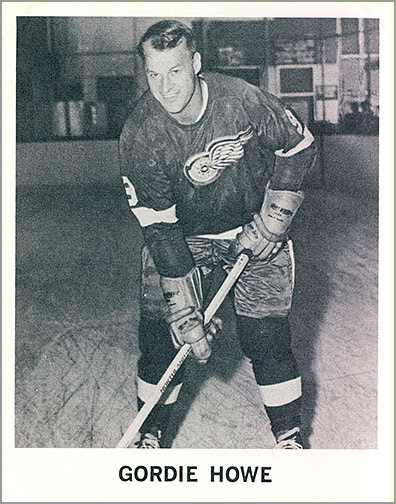 That season, Howe again won the Stanley Cup with Detroit and played in his eighth NHL All-Star Game. Save $10 with offer code SUN or $30 with offer code BEACH at checkout. 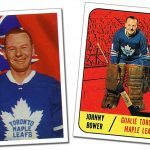 In 1955-56, Parkhurst only issued cards of Montreal Canadiens and Toronto Maple Leafs players, while Topps did not make any hockey cards at all. So, Howe did not have a card issued this season. Howe was named a Second Team All-Star at the conclusion of the 1955-56 season. 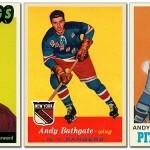 During the 1956-57 season, neither Topps nor Parkhurst made hockey cards. 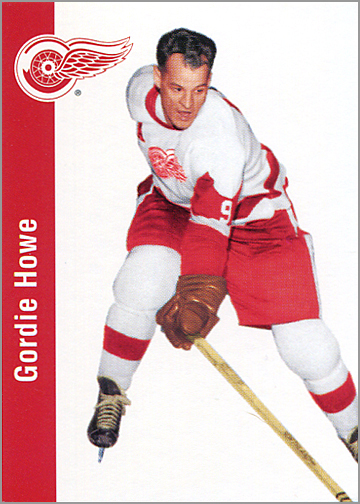 So Howe did not have a card for the 1956-57 season…until almost 40 years later. More on that in a moment. On the ice, Howe won the Art Ross Trophy, the Hart Memorial Trophy was a First Team All-Star and played in the NHL All-Star Game. 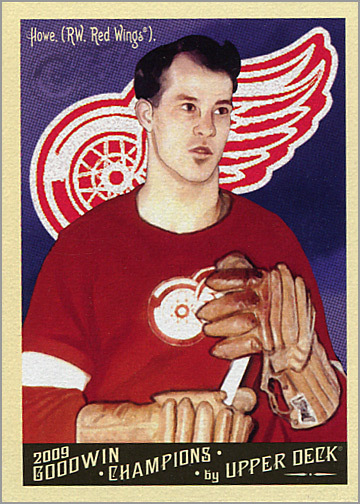 In the 1993-94 season, Upper Deck released a set of trading cards called “Parkhurst Missing Link,” which featured players from the 1956-57 season and had a retro, 1950’s design. 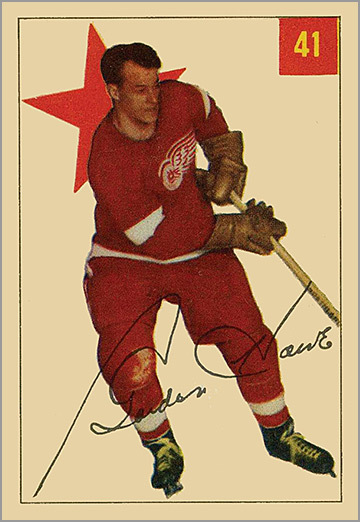 Even though the set came out after Howe’s career ended, his card is shown here because it is meant to be his card from the 1956-57 season. 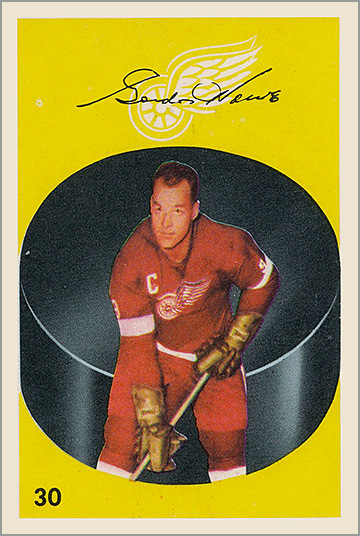 Howe’s 1957-58 Topps Hockey card has a bright orange background; it probably would have looked better if it had a yellow background like Glen Hall’s rookie card. Regardless of aesthetics, Howe’s card is the most valuable card in the set. That season, Howe won the Hart Trophy, was named to the First All-Star Team and played in the NHL All-Star Game for the 10th time in his career. 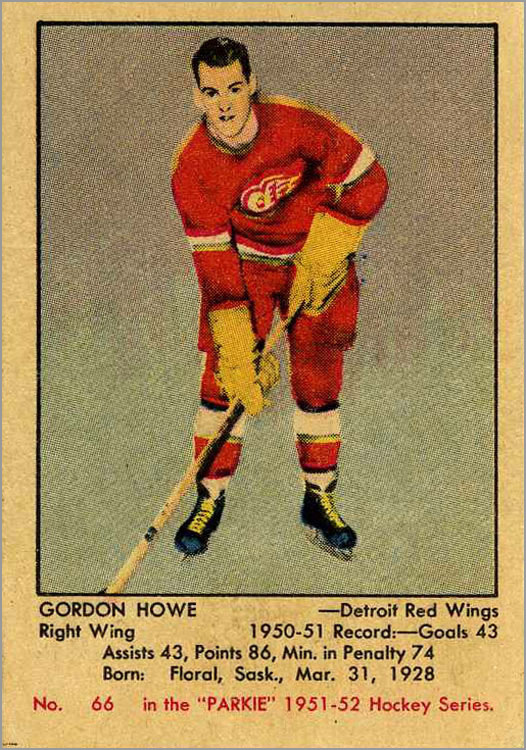 On his 1958-59 Topps Card, Howe’s first name is incorrectly spelled “Gordy.” Howe was named to the Second All-Star Team and once again played in the NHL All-Star Game. 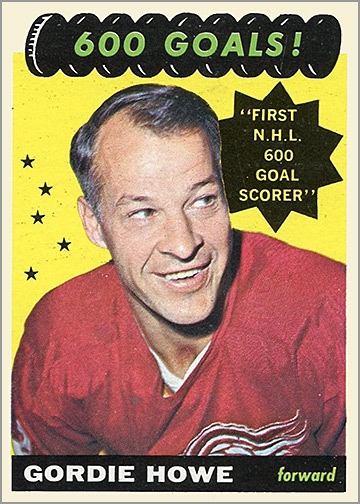 Howe nabbed the Hart Memorial Trophy as league MVP for a fifth time, was named to the First All-Star Team and played in the NHL All-Star Game during the 1959-60 season. 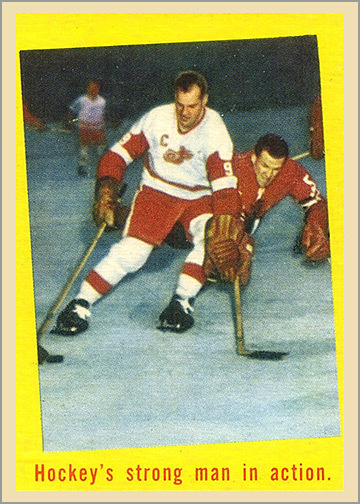 Howe’s 1960-61 Parkhurst card refers to him as “Gord” Howe instead of “Gordie” (or “Gordy” like Topps erroneously did a few years back). 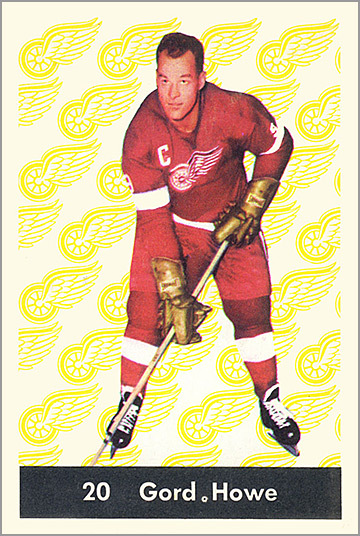 Howe was named to the Second All-Star Team and played in the NHL All-Star Game for the 1960-61 season. 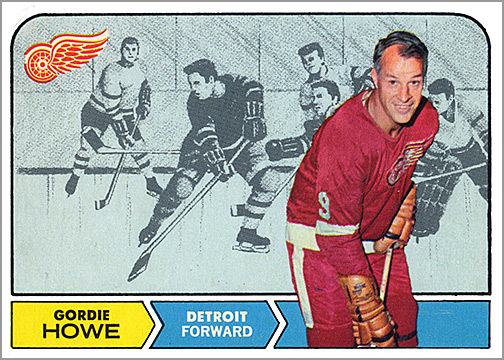 Howe’s 1961-62 Parkhurst card uses the exact same photo as his 1960-61 Parkhurst card. 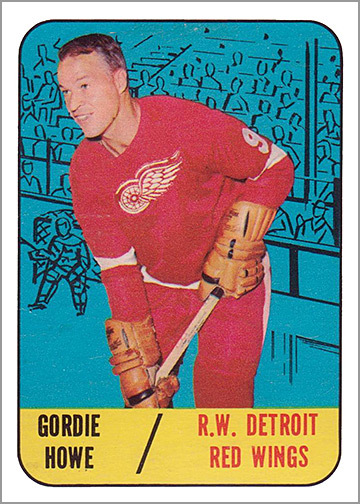 It also is card number 20 in the set and refers to him as “Gord Howe.” The only real difference are the yellow Red Wings logos. 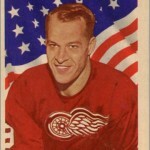 Mr. Hockey’s accolades were also identical as from the previous season: he was named to the Second All-Star Team and played in the NHL All-Star Game. 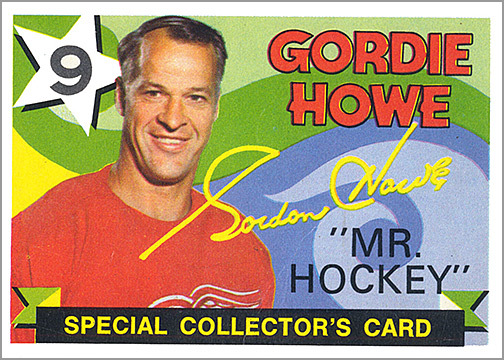 Even though he was called “Gordie,” Mr. Hockey signed his name as “Gordon Howe,” as shown on this 1962-63 Parkhurst card. The 1962-63 season was another career year for Howe. He won his sixth and final Art Ross Trophy, leading the league with 83 points. He also won his sixth and final Hart Memorial Trophy. He was named to the First All-Star Team and played in the NHL All-Star Game. 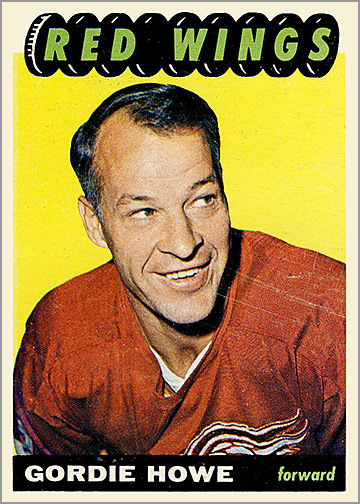 Gordie Howe’s 1963-64 Parkhurst card is my all-time favorite card of Mr. Hockey. From the big smile on his face, to the waving American flag in the background, to the super-oldschool brown gloves peeking in at the bottom of the picture, everything about this card is awesome. While Howe did not win any individual awards that season, he did participate in the NHL All-Star Game for the 16th time. 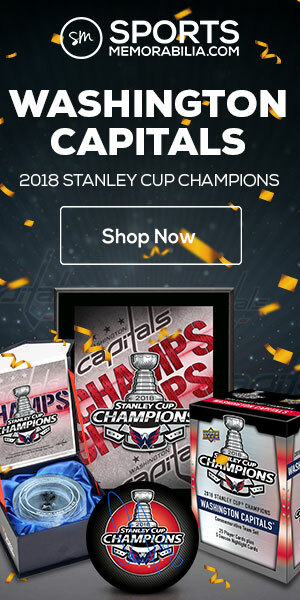 Topps’ hockey cards got taller for a season, measuring 4 3/4″ instead of 3 1/2″. So did their football and basketball cards. A season later, Topps would revert back to the tried-and-true standard size of 2 1/2″ by 3 1/2″. 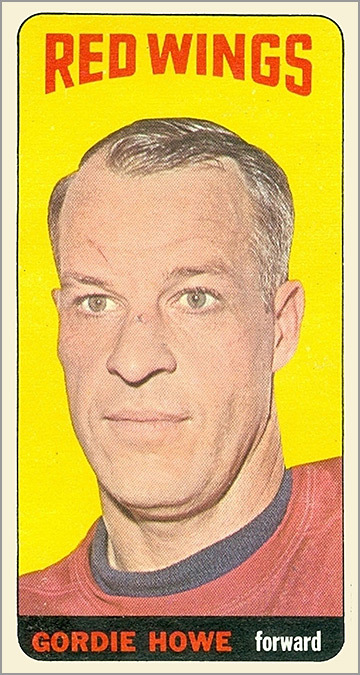 Admittedly, this is not a very flattering picture of Mr. Hockey, but then again many vintage card photographs aren’t. For the 1964-65 season, Howe was named to the Second All-Star Team and — surprise, surprise — played in the NHL All-Star Game. This season, he became the first NHL player to score 600 career goals. Howe was named a First Team All-Star at the conclusion of the 1965-66 season. The 1966-67 Topps Hockey set is well-known because it is the set that has Bobby Orr’s rookie card. That season, Howe was named a Second Team All-Star and played in the NHL All-Star Game. This card looks great because it uses the primary color triad of red, blue and yellow. That and because the illustrated goalie in the background is about to get an elbow to the face! In the NHL’s first expansion year, when the league doubled from six to 12 teams, Howe was a First Team All-Star and played in the NHL All-Star Game. In Howe’s 23rd season, he enjoyed personal bests for assists in a season (59) and points in a season (103). Like the previous year, he was named a First Team All-Star and played in the NHL All-Star Game for a 20th time. Does this picture look familiar? 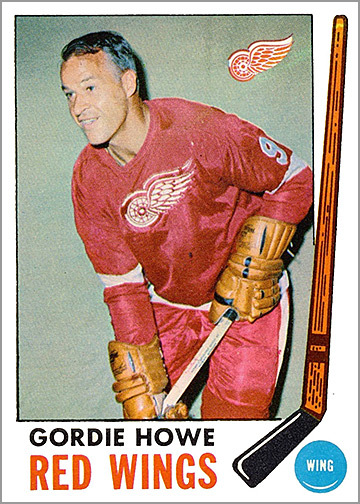 That is because Topps used it on Howe’s 1967-68 card, albeit this time with a less-awesome background. Topps did this sort of thing all the time. Just like the 1967-68 and 1968-69 seasons, Howe was again named a First Team All-Star and played in the NHL All-Star Game. 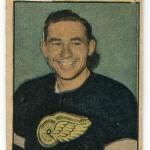 In his 25th and final season with the Red Wings, Howe was third on the team in scoring. Not bad for a 43 year old man. He appeared in the NHL All-Star Game. After the season, he retired — for the first time — due to a chronic wrist problem, and took a job with the Red Wings management. 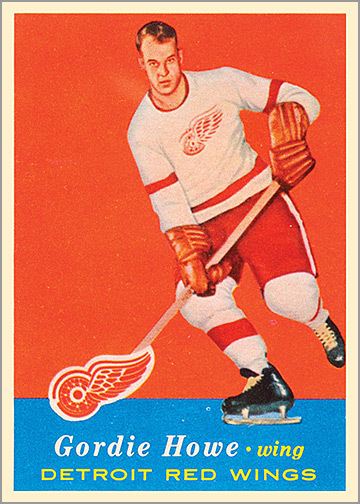 Although Howe had retired, Topss still included him in their 1971-72 Hockey card set. 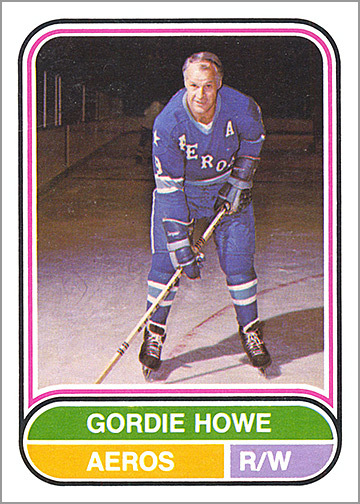 O-Pee-Chee also included Howe in their hockey card set, which differed from the Topps card, commemorating his career. 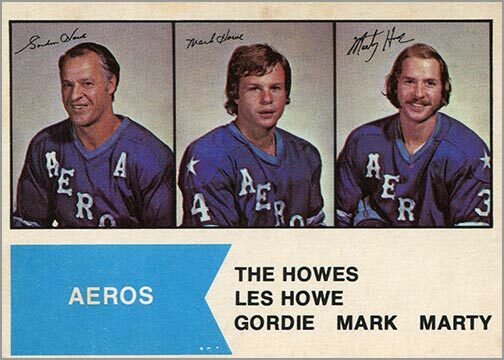 Howe had wrist surgery, was coaxed out of retirement and made a comeback, skating alongside his sons Mark and Marty on the Houston Aeros of the World Hockey Association. 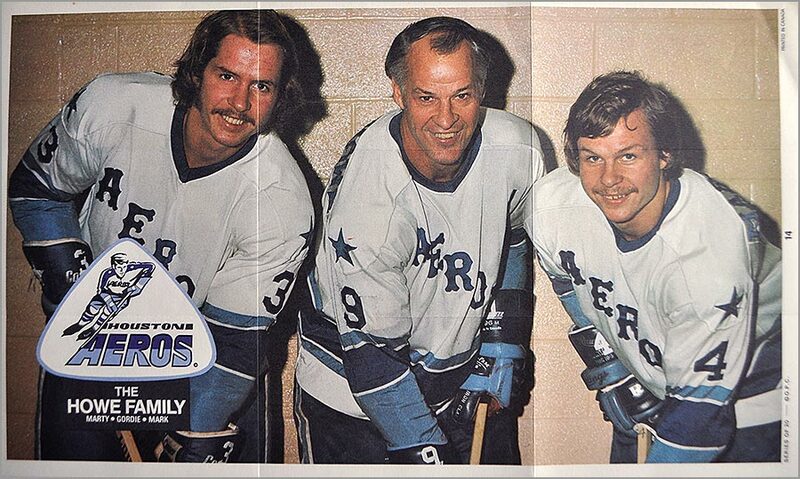 Although he did not have a hockey card that year, Howe does appear with his sons on a 1973-74 O-Pee-Chee WHA poster. Howe’s first season in the WHA was great. He was a First Team All-Star, helped his team win the Avco World Trophy as league champions and won the Gary L. Davidson Award as the WHA MVP. 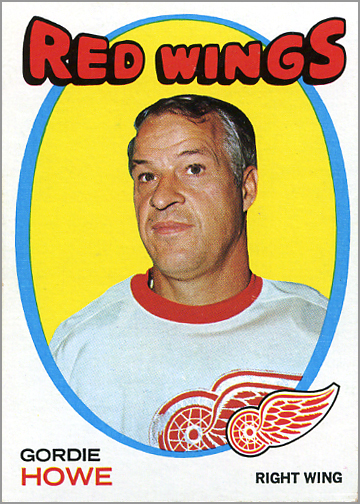 This is one of Mr. Hockey’s most famous trading cards, because it shows him and his sons Mark and Marty, and was his first cardboard since 1971-72. This card is considered Marty and Mark Howe’s rookie card — and Mark would go on to a Hall of Fame career of his own. For a second straight year, Howe was named a First Team All-Star in the WHA, and again helped the Aeros win a second consecutive Avco World Trophy as league champs. In 1975-76, Howe had his best point total in the WHA, with 32 goals and 70 assists for 102 points, and easily led the Aeros in scoring. This year, the league’s MVP trophy, the Gary L. Davidson Award, was renamed the Gordie Howe Trophy. 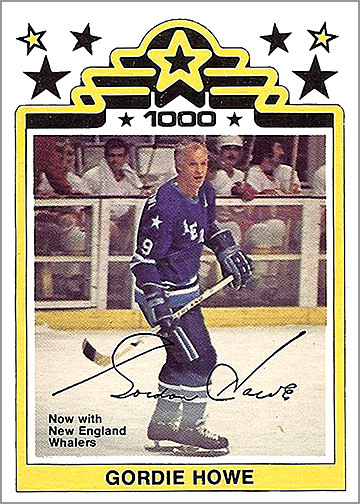 On December 8, 1977, Howe scored his 1,000th career goal, between his NHL career and his WHA career, counting both regular season and playoff goals. Howe’s last WHA trading card commemorates his 1,000th professional goal. It also notes “Now with New England Whalers,” as he and his two sons signed as free agents with the Whalers in the summer of 1977. 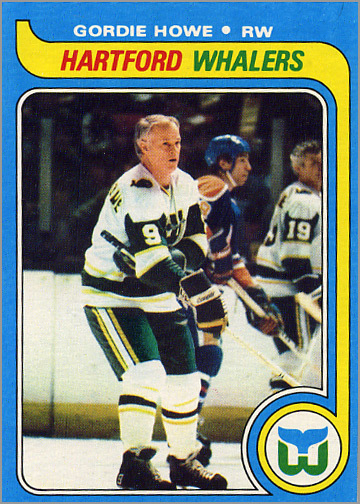 O-Pee-Chee did not issue a WHA trading card set during the 1978-79 season, so it was another year without a hockey card for Mr. Hockey. The NHL and WHA merged prior to the 1979-80 season. The New England Whalers, now called the Hartford Whalers, retained Mr. Hockey when they entered the NHL. 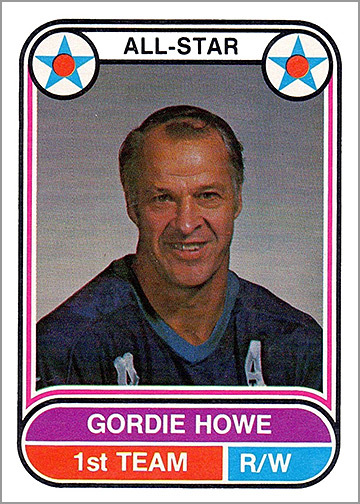 Howe’s last trading card issued during his career came out in the 1979-80 Topps and O-Pee-Chee sets. Both use the same photo. 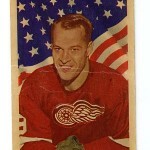 Howe played in all 80 games, and appeared in his 23rd and final NHL All-Star Game, which was held at the Olympia in Detroit. 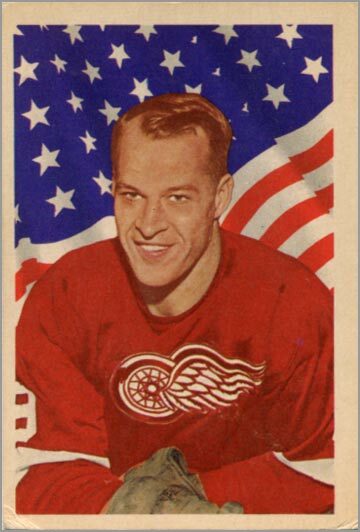 Mr. Hockey, many times, had multiple cards issued in a season. Here are five of my favorite vintage Howe cards not shown above. In 1965-66, Coca-Cola issued a set of 108 black-and-white hockey cards. 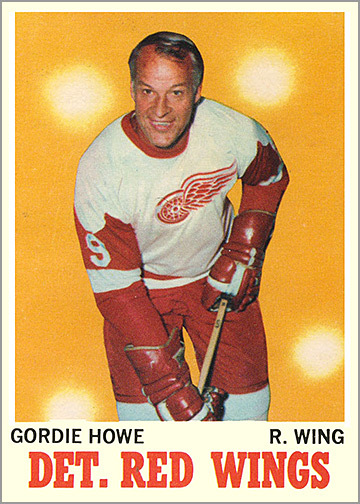 No other card epitomizes Howe’s style of play better than this one. The caption on this card, “Hockey’s strong man in action,” says it all as Howe powers around a Black Hawks defender, handling his stick with one arm while using his other arm to push away his opponent. Howe became the first NHL player to reach 600 career goals. Topps commemorated this milestone with a special card in their 1965-66 set, though it uses the same photo as Howe’s regular 1965-66 Topps card. Another card from the 1975-76 O-Pee-Chee WHA set. 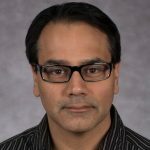 The hair is thinning, but the smile is still strong. 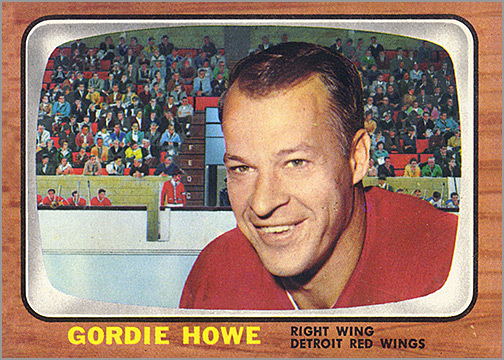 Howe was featured on hundreds of trading cards in the 35 years since his retirement. 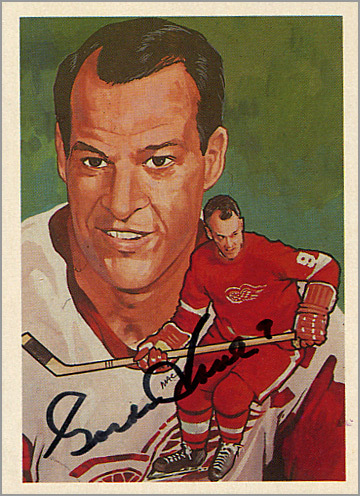 Below are a five of my favorite cards that show artistic renderings of Mr. Hockey. This painting was first used in the 1983 Hockey Hall of Fame postcard set, illustrated by Carlton McDiarmid, and later in the 1985 Hockey Hall of Fame trading card set. Howe autographed this for me in 2009. 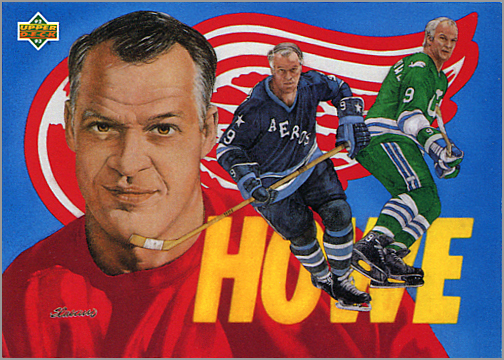 In 1992-93, Upper Deck released an insert set that highlighted Howe’s career. 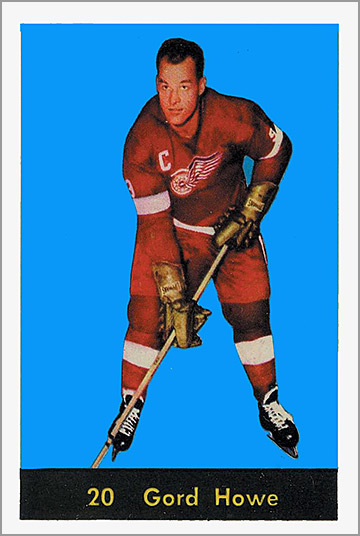 The final card, a checklist, used this painting of Howe. I like it because it shows him not just with the Red Wings, but with the Aeros and Whalers as well. 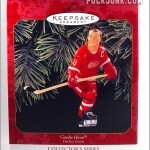 This 2009 Goodwin Champions card uses an illustration of Howe as an 18-year old rookie with Detroit. 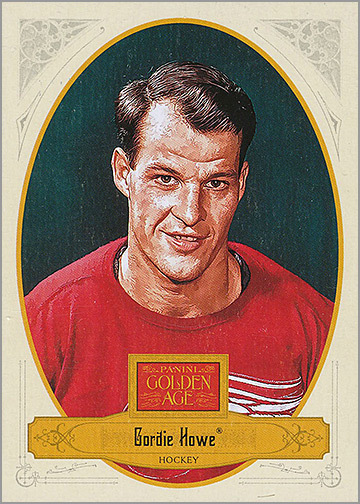 The illustration on this 2012 Panini Golden Age card is based on a famous photo of Howe. The card comes in the standard size of 2 1/2″ by 3 1/2″ (shown here) and in the smaller “cigarette-card size” of 1 1/2″ by 2 5/8″. 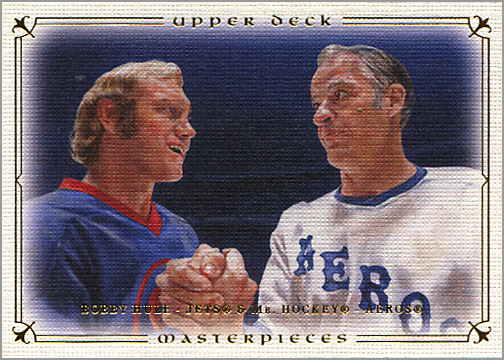 The painting on this card shows Bobby Hull and Gordie Howe when they played in the WHA; Hull with the Winnipeg Jets and Howe with the Houston Aeros. 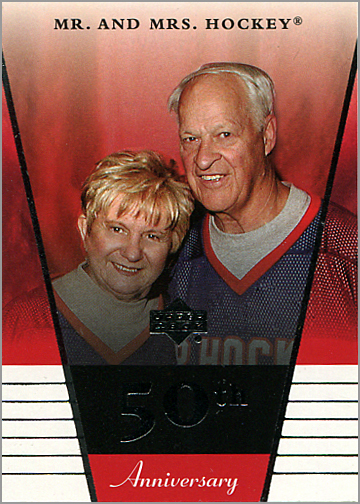 This card, released in 2003-04, shows Gordie and his wife Colleen, together in 1953 — the year they were married. Colleen later became a sports agent for Gordie, Mark and Marty and managed Gordie’s endorsement deals. She was the first woman to be a sports agent and the first woman to be inducted into the U.S. Hockey Hall of Fame. Special thanks to HockeyMedia.ca for providing many of the card images in this article. The rest of the cards are from my personal collection. Actually 1962-63 Parkie has TWO of Gordie–#30 and 31. Double your pleasure that year!